as long as it is mail inspired, is stamped, then it qualifies. so it was awesome to finally give it a go! This is a new style for me…but oh soooo much fun. and flicked with water. As I was only playing around, I decided to color the splats with some of the blue ink. The main colours are blue and green with the background paper inked and stamped in browns. only because I was a little short on stamps for this challenge. and the occasional guest designer who plays along with us. FSC is a busy place to be! Please pop over to FSC and check out the awesomeness of the stampettes!!!! They are amazingly creative people with some wonderful ideas. ~ Anything But a Card – Get Messy! Wow have I missed a lot sweetie. Love the new blog look so fresh looking and easier on the eyes. Beautiful DT piece you have captured the Mail Art beautifully. Very pretty with a super grungy feel to it. Dot, I love this! That grungy neutral background piece looks amazing with all the lovely postcard panels in blues. So much detail and the splats add another great touch! Did I say I love this???? Hugs! A fabulous way to interpret the theme Dot. Love the postcards and stamps and what a fabulous background to sit them all on. Oh this is totally wonderful! 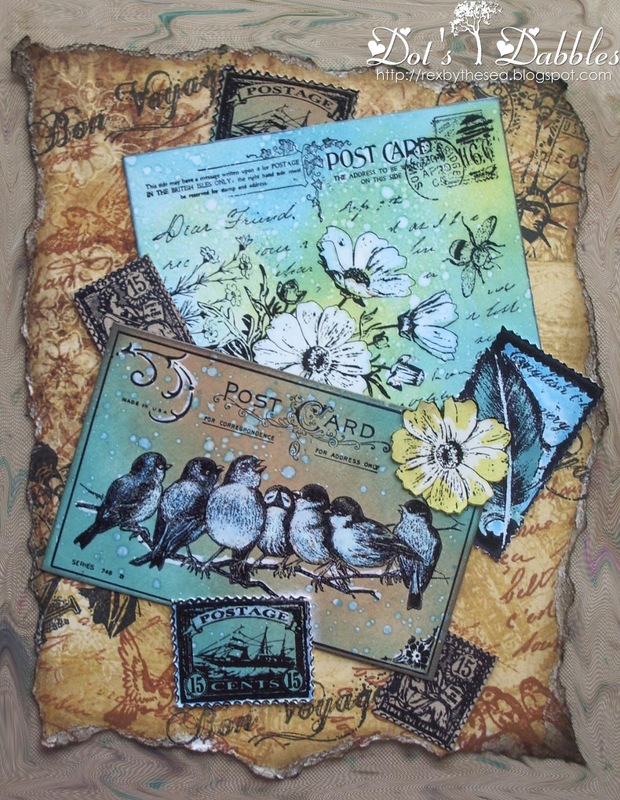 I love the particular stamps you have used and you have used , coloured and layered them so well to stunning effect. LOVE this, great colours too! All that flicking and splatting certainly has created some fabulous effects Dot, I imagine you had real fun making this one. Hope you have a good Sunday, or at least what's left of it your side of the world. Gorgeous project, love the grungy ages backgrouns and of course those fabulous post cards. Wow Dot, such a wonderful creation. So many things to see. Love the color combination and the birdie image. Utterly lovely, Dot- those postcards are exquisitely tinted… great images to start with, but you've really made them sing! Love how you've layered up the elements over that distressed letter background – brilliant! This is wonderful! Love the postcard images and the way you've coloured them – great background too. Very pretty piece! Thanks so much for playing along with us over at the Simon Says Stamp Challenge blog! This is fabulous Dot, love the colours and the way you've layered all the images up looks great. Love it! Wow I love your project.. it is stunning. Thank yo for joining TTCRD this week. OMg, how gorgeous is this! Fabulous details and love those stamps!